Love is free, right? 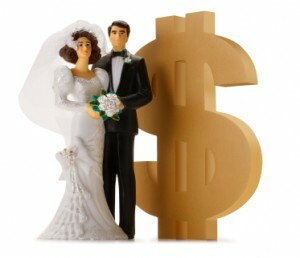 Not according to Bride To Be magazine whose 2010 survey found that the average Australian wedding costs $49,000. At MyBudget, we often see couples who have debt-hangover from their wedding, which is certainly not the ideal start to a marriage. It’s time, therefore, to replace the popular notion of the perfect wedding with nuptials that are perfectly affordable. Vow #1: We will not go into debt for our wedding. It’s easy to get carried away with wedding plans because a wedding is a very emotional event. You want the day to be perfect, which means you’re more likely to let expenses get out of control. But you can eliminate that risk. Before you start writing a guest list—even before you set a date—make a commitment to each other that you will not go into debt for your wedding. This means you’ll need to use existing savings or create a savings plan to pay for your big day. Vow #2: We will create a wedding budget and stick to it. After you’ve agreed on the total budget amount, create a wish list of all the things you’d like to include in your wedding—everything from the venue to V8 Supercars! Don't hold back. Once you’ve written down every budget item you can think of, organise the list into descending order of importance with the “must haves” at the very top, the “would likes” in the middle, and the “could live withouts" at the bottom. Prioritising your budget items in this way will help you to cut costs on those things which are less important to you. Vow #3: We promise to compromise by focusing on what’s important. Compromise is not only the key to a long, happy marriage, it’s also one of the cornerstones of financial prosperity. Good money management is about controlling your spending and making choices based on what you can afford rather than what you want. An evening gown, cocktail dress, pants suit, something comfortable!